Action and excitement with our toybox heroes, in a punchy activity pad with 13 reusable stickers to enjoy again and again. Now you can decorate each page in all sorts of different ways! This vibrantly colourful pad contains sixteen A4-size posters to pull out and decorate with stickers. 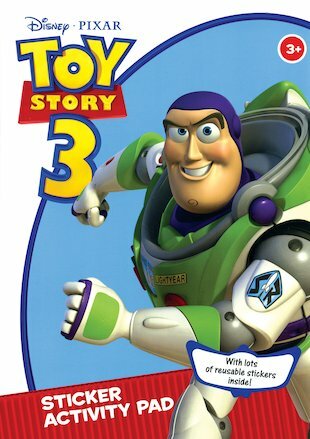 From daring escapes to peril in the playroom, and from cool character portraits to awesome action scenes, join Buzz, Woody and all the rest for heaps of awesome adventures! These bright posters are ideal for putting up on walls and doors – and if you really want to get creative, just get your crayons and make your own additions to the pictures!